History: Skyjet was formed on October 10 1990 by Henri Fabri and Pierre Vandenbroucke to operate world-wide pax and cargo charters from Charleroi. By the end of 1990, one B737 was ferried to this airport but like the other three B737s and DC8 never entered service. Operations started with a leased B727-200 of JAT, which made between July and November 1991 some ad hoc charters from Brussels. During 1992 Skyjet Inc (Antigua) was formed by the same persons and they leased a DC10 in November 1992. This airframe was subleased to Skyjet (Belgium) and received a Belgian registration in June 1994. One more DC10 went the same path while the other three remained with Skyjet Inc. These DC10s saw mostly life with other airlines like: Shabair, Air Zaire, Ghana Airways, Guinee Airlines, Air Afrique, Saudi Arabian and Sobelair. During 1994 subsidiary Skyjet Brasil was formed operating one DC10 and one B707 freighter from its Sao Paolo base, but ceased activities two years later. Skyjet (Belgium) was renamed to Skyjet Europe on September 4 1998. 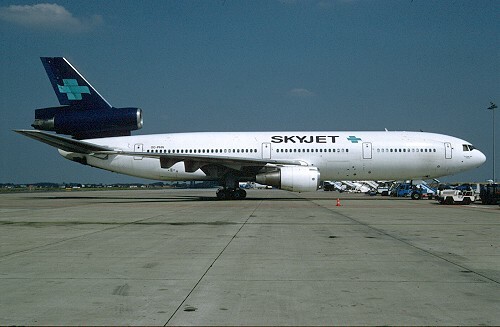 Another subsidiary was formed on May 28 1999: Skyjet France to operate two DC10s (pax and freighter) from Paris and Lyon, but never made a single flight and was shut down on October 15 2001. During 2000 the Belgian CAA refused to prolong the Belgian carrier license to fly. Operations continued via a Greek license in the form of Electra Airlines with three ex Skyjet DC10s. Henri Fabry started a new project called Aerowings operating a single ex Skyjet DC10 which remained on the register of Antigua. Both Skyjet Inc and Skyjet Europe ceased operations on December 31 2001. Also Aerowings ceased on September 15 2002 but operations continued under Swiss subsidiary Astra Airlines, lasting till February 2003 when the sole DC10 was returned to the lessor. Finally the Greek CAA revoked the license of Electra Airlines ending their operations on June 25 2003.